It’s their server, they can do whatever they want, including arbitrarily banning you. Complaining on the forums won’t do anything, and trying to warn others won’t help because PC players rarely post here anymore. Of course they can, which is why I’m just warning anyone who happens on it. It’s no big deal as that server is nothing anyway. Admins ban for no reason but to prove they are “superior”. I wish I wasn’t so bad at names, if I saw them I’d remember! I <3 you all. RE: Hey, can we all talk about FFA? Reason for Applying: It is an almost daily occurrence where I am being kicked or seeing others kicked just for being better than someone/high rank. 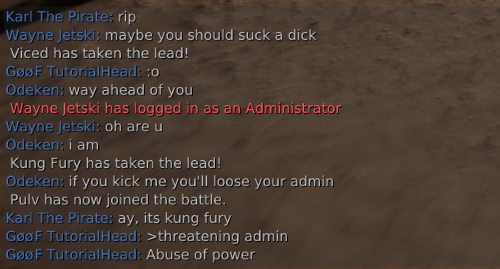 It is sometimes not possible to get hold of one of the admins in the group. I’ve been playing this game since 2012 so I figure this would be a way for me to help out the community that has been good to me these years. Relevant Experience: For 5+ years I have been a moderator for a popular YouTuber (X / davidangel64), I was one of the administrators in EVE University for a couple years (2000+ people). I have done mod/admin work on many websites and even made my own websites through the years. I have been mod/admin on many game servers throughout the years including back in 2013 I operated a Chivalry server. I don’t know if this counts but irl I am an air traffic controller so I moderate the skies lol. Basically I understand the requirements and responsibility that comes with administration and how crucial it is to not kick/ban for petty personal grievances. I can definitely be a positive help to the community. I get almost insta votekicked outta servers for rank, or for k/d ratio cause obvious hax. Then when I find a server I can stay in, my friendly vanguards seem to enjoy jumping into me while the knights finish me off! Then if I am lucky enough to survive that the new friendly archers are sure to practice their bow skills on my head. That is all well and good… but then the server gets bombarded with rank 0’s with ping ranging from 150-900 who teleport behind you and finish you off. I did manage to entertain them with a shiny spectral echo for a while. That kept them busy and let me take a breather. How dare mods enforce torn banner rules on a website torn banner pays for and runs for people to discuss their game. How dare they tell you not to be disruptive on their own website! You, someone who doesn’t pay for, manage, or run the site and just takes up some space on it, should have the utmost say in everything that goes on! These mods are horrible for trying to make this place better and remove trolls. How dare they, I say again HOW DARE THEY!